Doctor Jean Crim Eells is a familiar face for many of us at IAN and ICEC. She was quite surprised when we informed her she had won this award, since she did not apply. A fellow former Naturalist had nominated her. Jean’s influence on environmental education started in 1982 while she was the EE Coordinator for Hamilton County Conservation. In 1988 she won the President’s National Environmental Youth Award. Then, in 1991, she won Conservation Educator of the Year from the Iowa Wildlife Federation and the Outstanding Environmental Educator Award from the Iowa Sierra Club that same year. She has been a board member for numerous organizations through the years and the list of her accomplishments is astounding. Her current work focuses on conservation outreach to women farmland owners. Her consulting business in environment, education, evaluation and energy, E Resources Group, has been operating for 22 years. Learn more about Jean at her website https://eresourcesgroup.com/. Congratulations Jean, and thank you for your continued dedication to conservation. 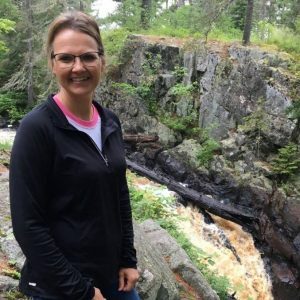 Nominated by her daughter, this mother and high school teacher of biology, anatomy, and physiology, and now environmental studies and co-teacher of a few agriculture classes has kept busy the last 20 years at Pella Christian High School. Audra has poured countless hours into revamping her classes, keeping up with the rapidly changing standards through the years. Constantly wanting to expand her knowledge to better teach her students, Audra sacrifices her after school hours, weekends, and summer vacations to advance her scientific understanding and teaching skills. Audra has even driven an hour, one way, to a planetarium, just so she could have a better understanding about what she was going to teach her students in her seven-day winterim. Her dedication doesn’t stop there. Helping design a four-and-a-half-acre prairie at their school and hand weeding it every year isn’t enough either. Every year for the past 15 years Audra’s goal has been to take all sophomore students (about 70 each year) on an all-day field trip to creeks and wetlands in the Pella area. As we all know, all day field trips like that are a lot of planning. Audra, thank you for all your time and effort you pour into teaching the future of our society. Holy cross-curricular!! The Decorah Seventh Grade Team works wonders at bringing science, geography, and English together! They do a year-long unit called “One Well” to focus on local and global water issues. This all grade program started in 1993! The local Naturalist helps with this unit and thought they should be recognized for their efforts. We agree! A variety of speakers are brought in to discuss various water topics with all the students (about 120 kids each year). The kids get to make different terrariums in plastic bottles, and they get to explore current topics like the Flint, Michigan water crisis. Students get to see learning concepts come to life during their fall field trip to Lake Meyer. Touring a wetland, collecting macroinvertebrates, and even chopping open goldenrod galls to illustrate the various organisms in the surrounding environment are just a few of the fun things they do on the field trip. Those lucky seventh graders get another field trip in the spring too! Here they spend two days touring different locations in Decorah like the fish hatchery, the wastewater treatment center, and even a car wash. Kudos to the teachers for coordinating ALL that! In English class they read A Long Walk to Water by Linda Sue Park. The book is about the struggles that African American women often face walking miles every day to get dirty water from a well for their families. The coolest part of this whole unit is toward the end of their school year. 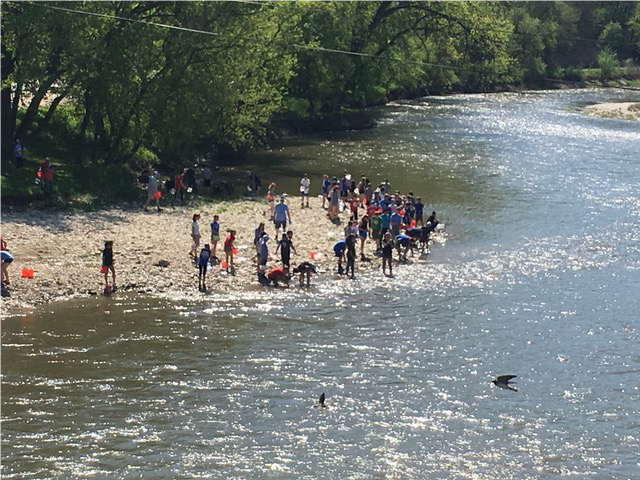 The kids will walk almost four MILES to the Upper Iowa River to collect water and haul it back in ice cream buckets and open milk jugs, trying to bring back as much water as possible, just like in the book they read. 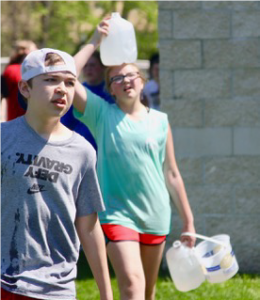 In 2018, the kids used their water hauling experience to talk to others in school and their community about our water privilege and raised five thousand dollars! The money went to Water to Thrive, an organization that works with rural Africans to provide access to clean, safe drinking water in their communities. Thank you to the Decorah Seventh Grade Team for your time and effort put into this inspiring and empowering unit! 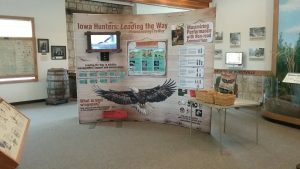 The Blank Park Zoo, along with a diverse team of partners, developed the “Iowa Hunters: Leading the Way” outreach program to educate Iowans about the harmful effects of lead ammunition while honoring the conservation legacy of hunters in Iowa. As part of the outreach effort, the zoo created three interactive, portable displays to loan out across the state. The display compares lead ammunition to alternatives, has interview videos of hunters that have switched to non-lead ammunition, the effects of lead ammunition on eagles and other wildlife, and more. Colorful brochures come with the displays as well. Online, the Leading the Way program provides extensive supplemental information such as where to purchase non-lead ammunition from local and online sources. In the first couple of months, these displays saw over 10,000 in-person interactions at 41 events. Thank you Blank Park Zoo for continuing to work with partners to present scientifically proven information about lead ammunition and alternatives. Kay Neumann started the non-profit SOAR (Saving Our Avian Resources) over twenty years ago. In 2018, this raptor rehabilitation center located in western Iowa admitted over 400 patients. With the use of non-releasable live raptors, SOAR conducts programs across Iowa to bring attention to conservation issues related to raptors, such as lead ammunition and tackle in our environment. Thora, a bald eagle, is one of SOAR’s non-releasable educational birds with permanent eye damage from lead exposure. Since 2004, SOAR and other rehabilitators have conducted blood tests on bald eagles admitted to their facilities. 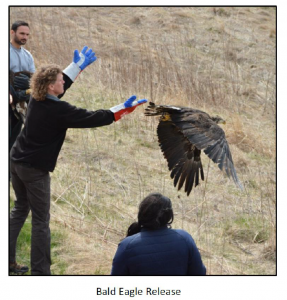 In 2017, SOAR had an article published in the Journal of Fish and Wildlife Management detailing their data analysis on lead poisoning in bald eagles. The findings indicated that adult bald eagles had higher lead concentrations than young eagles. Lead concentrations were highest across all ages of bald eagles during October through January, which is the same time frame as hunting and trapping seasons in Iowa. SOAR uses this information and conducts presentations, like the 125 programs they did in 2018, to promote the use of non-lead ammunition. Each year SOAR will talk to over 8,000 people and through other use of media, their information reaches over 10,000 people. 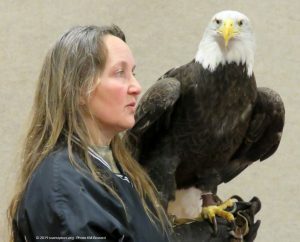 Thank you, Kay, and the entire SOAR team, for educating the public about the extraordinary raptors of Iowa, and the dangers of lead ammunition and tackle. Leaf it to Audra Faber of Pella Christian High School to help beatify the school campus with trees and shrubs. Every year Mrs. Faber teaches students about trees. When the school moved to their new location in 2007, the trees were quite sparse, and the kids had to be bussed to other locations to collect leaves and view trees. 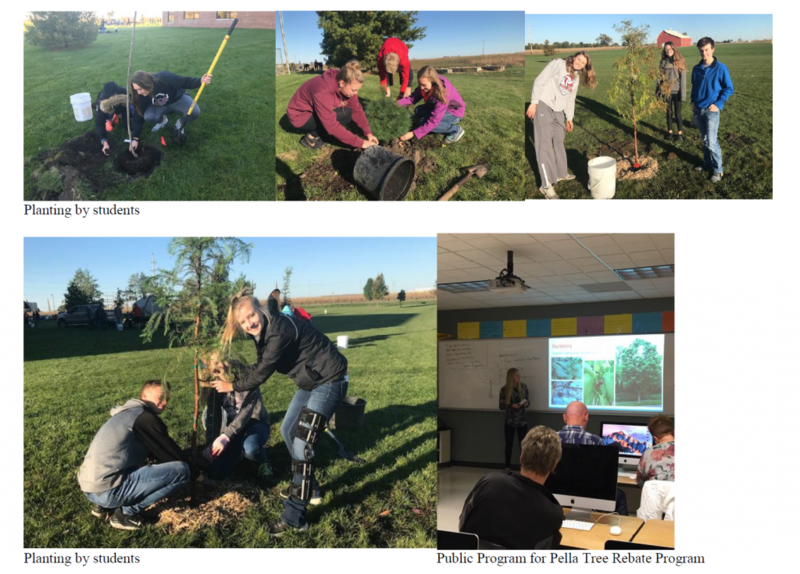 In 2018, Audra coordinated the Iowa DNR “Trees for Kids” grant application and received $5,000 to plant 54 native trees and shrubs on the Pella Christian High School 33-acre campus. The Biology II class of juniors and seniors learned how to properly plant trees, and then led a group of two to three sophomores and other seniors on the day of the tree planting. The principal noted the Biology II student leadership of leading the planting and remarked on how well the students had been prepared for the tree planting. The Pella Biology II students weren’t done there though. The students had studied the benefits of planting trees and wrote their knowledge in a master plan document that included the varieties and locations of each tree and shrub. Two of the students also did a radio segment explaining how the tree planting took place and the benefits of trees. All the Biology II students researched various tree types that were part of the Pella Tree Rebate Program. 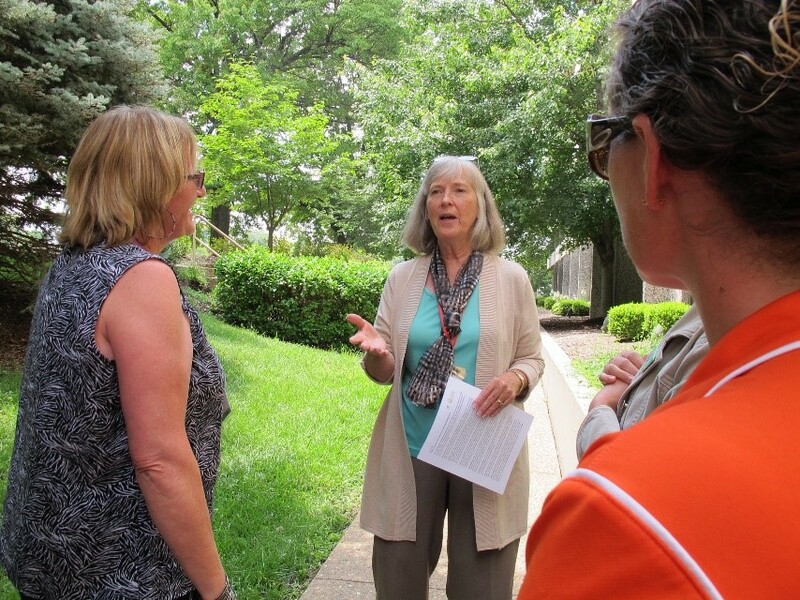 They presented this information to the public to help residents learn about those trees and the benefits of each kind. Thank you, Audra, all the 2018 Biology II students, and supporters that helped make Pella more knowledgeable about trees, and Pella a little bit greener. Nominated by a former Naturalist, Charlene Elyea is this year’s winner of the Outstanding Environmental Education Program with two or less interpreters. Since 2001, O’Brien County has been lucky enough to have Charlene Elyea be their Naturalist. Where is O’Brien County you ask? It is tucked away in the prairie pothole northwest corner of Iowa, with a rural population of 13,000. Charlene keeps quite busy with the rural population, seeing almost every classroom in the entire county every year! WOW! By the end of November in 2018, Charlene had seen 17,111 participants. She does all of this with $2,000 for supplies and $2,500 for the Prairie Heritage Center display maintenance. Way to go Charlene!!! This ambitious lady doesn’t stop there. 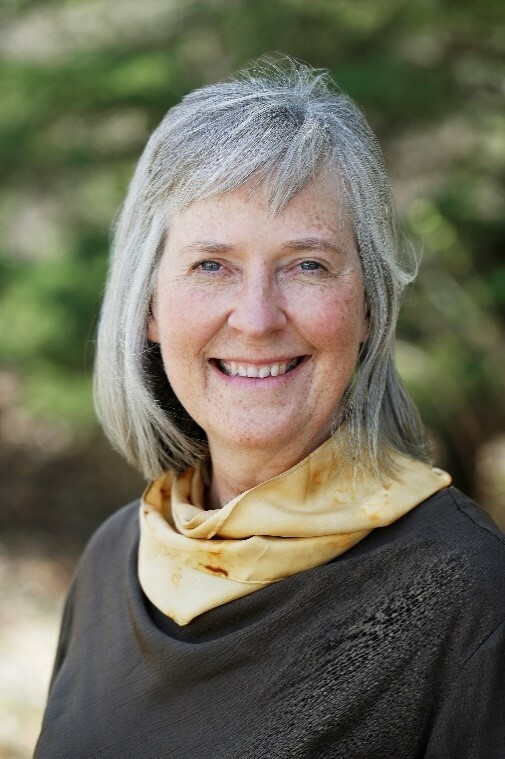 She is also an active member of several committees including O’Brien County Tourism, O’Brien County Community Foundation, Glacial Trail Scenic Byway, REAP CEP Review Board, and Iowa Association of Naturalists Professional Development and Scholarship Committees. Thank you Charlene for your outstanding efforts to bring conservation education to so many people in such a rural area. This dynamic mother-daughter duo was nominated by Sondra Cabell (Buchanan County Conservation) and Karen Phelps (Benton County Conservation). Back in 2013, sixth grader Coralee started volunteering for conservation efforts with her mother Ruby. Perhaps you have seen some of Coralee’s fabulous artwork. Coralee wrote and illustrated a series called “A Prairie Girl’s Notebook.” Karen Phelps published these notebook essays in the Benton County quarterly conservation newsletter. Coralee kept cranking out notebook essays from 2013 until the spring of 2018. You can still catch a few of Coralee’s past essays though, as Karen still publishes the essays in the current Benton County newsletter. 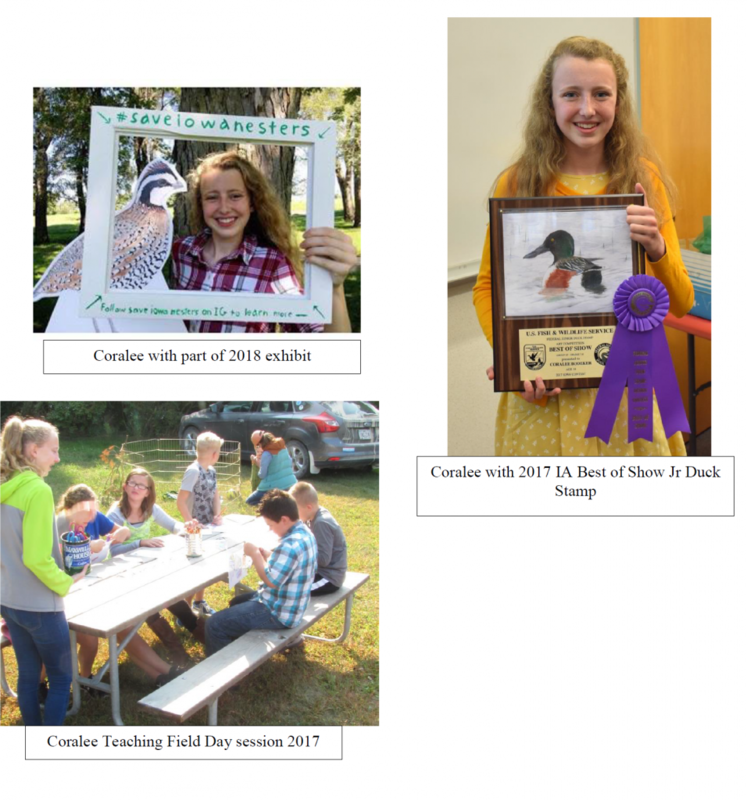 Coralee’s artwork did not stop with her notebook series; she also entered in the Iowa Junior Duck Stamp Program, receiving second place for her age group in 2014 and Iowa Best of Show in 2017. Her 2017 Best of Show piece went on to finish in the top 25 in the nation. You can see Coralee’s new traveling art exhibit, “Save Iowa Nesters,” at one of six nature centers in Iowa in 2019. Speaking of nature centers, Coralee and Ruby have also volunteered as nature center hosts for both Benton and Buchanan County Conservation. Coralee has even led a few program sessions for the Benton County Conservation and has led two field trips with the Iowa Young Birders. Besides working with Benton and Buchanan County Conservation, Coralee and Ruby are also winter raptor counters for the Iowa Raptor Project. The Iowa Raptor Project is sponsored by the University of Iowa Recreational Services and Kirkwood Community College. Thank you Coralee and Ruby for your past, present, and future conservation volunteer efforts.